Recognize the title quote? After finishing Jenn’s Swallowtail Shawl, I had to work on at least one WIP. In my case, that means any projects I am in the middle of, or had balled/frogged yarn. Whenever I start thinking of the project-in-hand, the obsession begins, and the tidal wave engulfs me. The best thing to do is just stay below the crest and not purl (surfing term for not nose-diving). Do another DFS in the bright cheery purple sock merino that Veronica sent me for Zarah’s Project Spectrum Dyed-Sockyarn-Exchange. Go for the delicate look and knit the true size of Swallowtail in my dark purple Misti Alpaca Lace skein. Combine the same yarn above with the skein used in the original pattern to double the thickness, but then I will have either to cut out some repeats or use a third yarn for the edging since I will be using a larger needle. Use my variegated Wool in the Woods’ Miss Mohair which has blue, purple, and some teal as the main part of the shawl, then use the combined Misti Alpaca Lace skeins for the edging. See if the sportweight Frog Tree I have in lilac would work color-wise for Dorothy. Attempt to knit a triangular shawl with aran weighted Feelings by Mark & Kattens in the dark purple with hints of blues and greens. Check to see if the purple Horstia I used for Cathy’s wrist-warmers would be too burgundy for Dorothy. Decisions, decisions! Maybe I should just give up the shawl for now and get my second Dutchican’s bath poncho done? 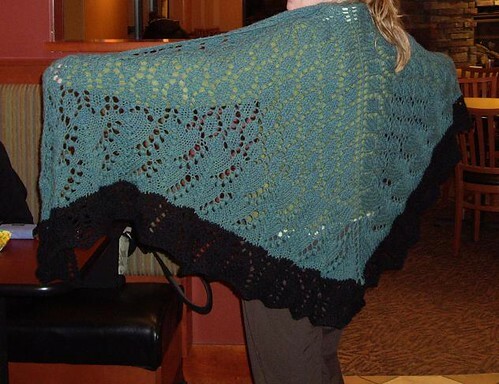 The Swallowtail Shawl looks great! It’s on my “to be knit someday” list, though somehow I thought it was smaller. I just have to find the right yarn. So many decisions and projects! It’ nice to have choices. Did you bunny finally stop sneezing and coughing? Glad to know Jessica Bunny is doing better. It’s heartbreaking when pets fall sick.